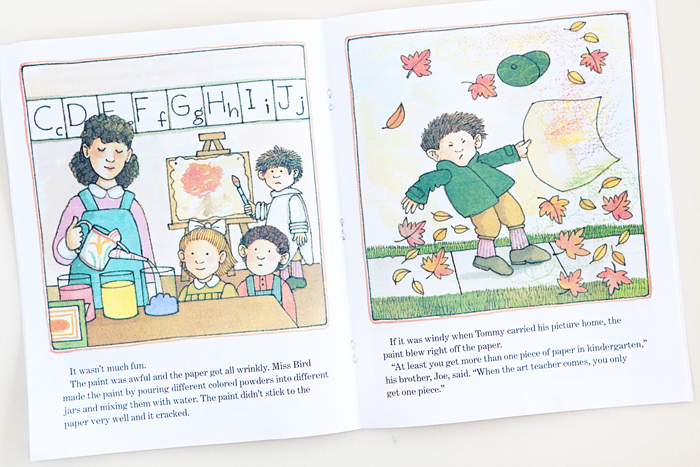 The Art Lesson tells about Tomie DePaola’s life as a young boy and his first encounters with school art lessons. He is appalled to find out that there are all these rules to follow. His art teacher finds a way to work around them, and Tomie learns some of his first important lessons in art and life. There are so many things I love about this story. I love books about how people came to discover their craft or vocation and I love books that tell about someone's own childhood experiences. They give another person's perspective of what it's like growing up. Children always seem to be curious about that. Avery’s favorite part was "when his cousins said that you’re not supposed to copy." Avery sometimes talks about becoming an artist. She’s mentioned in the recent past that she would like to be a book designer or a Hello Kitty artist. Today she said that she would like to be an “eraser artist.” She’s been into collecting mini erasers as of late. We shall see!